I know you will be used to seeing the same old, same old boring newsletters from Accountants. Lots of firms can’t be bothered writing their own newsletters, let alone writing one that is about business and profit growth, rather than just filled with tax or boring accountancy rules and regulation that don’t help you as a business owner. They are full of jargon which means nothing to most savvy switched on business owner’s. Well here’s our next installment! If you haven’t read it before why not grab a coffee and biscuit and take 5 mins to have a read………you never know it might just give you an idea to add a few thousand profit to that bottom line!!! Happy reading….there are lots of previous copies too, that you might want to make a note to download. As they are full of business and profit improvement advice aimed at helping you to make more money, make your business more efficient so you get more time with your loved ones rather than at work and save you tax (legitimately of course!). 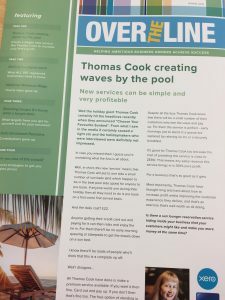 Here’s the latest version of KMA’s newsletter “Over the line” aimed at getting you over the line and achieving your business and personal goals. At KMA Accountancy, we do things differently, “we are not your typical accountants”, we are the leading South Manchester Management Accountancy Practice, based in Hale, Altrincham, where we help entrepreneurial business owners lead the life that they always wanted to when they first went into business. We help them to grow their businesses, make more profit, make their businesses more efficient so they are able to run without them and as a result spend more time doing the things that they want to do, usually spend more time on holiday (especially when it’s a bank holiday you can enjoy the time with your loved ones, rather than be tied to the office). We specialise in business and profit growth! That’s why we produce a very different newsletter that is all about business. With articles covering topics like marketing, finances, business improvement, strategy and getting the best from your team and having the best business that you can. So unless there is a very important piece of tax legislation you won’t find it mentioned in our newsletters. In this edition you can read all about…. Making Tax Digital alert – Don’t get caught out….get ahead of the game…well ahead of 95% of most small business owners who don’t know about this yet! A quick reminder on National Minimum Wage increases – A quick look up table so you don’t get caught out on the rates. Shooting hoops – How targets help to focus the mind and get you to where you want and need to be! Are you one of the crowd? – Secret strategies to get you higher prices! Hope you enjoy reading it as much as we enjoyed producing it for you …if you’d like a proper paper copy (if your anything like me I like to read mine over a coffee in a relaxed environment) then drop an email to wecare@kmaaccountancy.co.uk and we’ll get one winged across to you by return….happy reading. This article is for general information only and no action should be taken, or refrained from, as a result of this information. Professional advice should be taken based on specific circumstances in each individual case. Whilst we endeavour to ensure that the information contained in the article is correct, no liability will be accepted by KMA Accountancy which is a trading name of Kim Marlor Associates Ltd or damages of any kind arising from the contents of this communication, or for any action or decision taken as a result of using any such information. This entry was posted on Saturday, May 5th, 2018 at 6:24 am and is filed under Blog, Newsletter. You can follow any responses to this entry through the RSS 2.0 feed. Both comments and pings are currently closed.